This is a man. The man is my teacher. àThis is the man WHO is my teacher. The man WHO came here yesterday is my teacher. This is a man. You met him yesterday. àThis is the man WHOM you met yesterday. Ví duï 2: The man is my father. You saw the man yesterday. àThe man WHOM you saw yesterday is my father. Thay theá cho danh töø chæ thuù vaät , söï vieäc, vaät vaø laøm chuû töø laãn tuùc töø trong caâu phía sau. Ví duï 1: This is a dog. The dog is very big. àThis is the dog WHICH is very big. Ví duï 2: The dog is very big. It stands at the front gate. àThe dog WHICH stands at the front gate is very big. Ví duï 3: This is a book . You gave me the book yesterday. àThis is the book WHICH you gave me yesterday. Thay theá cho Tính Töø Sôû Höõu. (MY, YOUR, HER, HIS, OUR, THEIR) maø ñöùng tröôùc danh töø chæ ngöôøi, vaät, söï vieäc. Theo vaên phaïm coå, thì WHOSE chæ söï sôû höõu duøng cho ngöôøi coøn OF WHICH thay cho thuù vaät, vaät, söï vieäc. The man is my teacher. His daughter is a good student. àThe man WHOSE daughter is a good student is my teacher. Ví duï 2: The man is a teacher . I like his daughter very much. àThe man WHOSE daughter I like very much is a teacher. Ví duï 3: The table will be repaired. The legs of the table are broken. àThe table the legs of which are broken will be repaired. Ex: The dog is very big and angry . I gave a bone to it. The dog to which I gave a bone is very big and angry. à The dog that I gave a bone to is very big and angry. Ex: The old man and two dogs made much noise . They passed my house yesterday. àThe old man and two dogs that passed my house yesterday made much noise. Trong caâu thöôøng coù THE BEST vaø THE MOST. Ex1: He reads every book that he can borrow. Ex 2 : You are only person that can help me. Sau "IT + BE + …THAT = chính laø"
Ex 1: Who is she that you say hello? Ex 2 : What is it that makes you sad? Moät meänh ñeà tính ngöõ goïi laø giôùi haïn khi naøo noù caàn thieát cho yù nghóa cuûa caû caâu. . Neáu boû noù ñi thì caâu seõ khoâng ñaày ñuû yù nghóa. Ex: The book was interesting . I bought it yesterday. àThe book which I bought yesterday was interesting. Meänh ñeà tính ngöõ khoâng giôùi haïn laø meänh ñeà khoâng caàn thieát cho caâu . Neáu boû noù ñi thì meänh ñeà chính vaãn coøn ñuû yù nghóa . Noù chæ theâm vaøo meänh ñeà chính 1 ít chi tieát maø thoâi. Ex 1: Ñan Tröôøng is a famous singer. I admire him very much . àÑan Tröôøng, who I admire very much, is a famous singer. Ex2: His sister lives in Paris . She speaks French. àHis sister, who lives in Paris, speaksFrench. 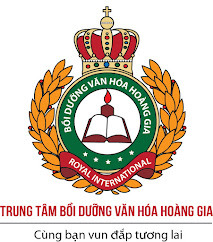 ú Khoâng duøng THAT trong meänh ñeà khoâng giôùi haïn. I. 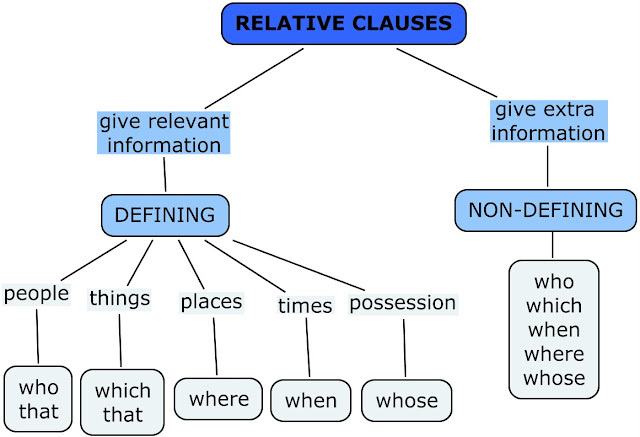 Fill in the blank with relative pronouns or relative adverbs, where necessary. II. Use relative pronouns or adverbs to join each pair of sentences below. 1. The professor is excellent. I am taking his course. 2. I saw a lot of people and horses. They went to the market. 3. I recently went back to Paris. I was born there nearly 50 years ago. 4. Do you know the music? It is being played on the radio. 5. You didn’t tell us the reason. We have to cut down our daily expenses for that reason. 6. The day was rainy. She left on that day. 7. One of the elephants had only one tusk. We saw these elephants at the zoo. 8. This is Mrs. Jones. Her son won the championship last year. 9. Is this the style of hair? Your wife wants to have it. 10. Max isn’t at home yet. That worries me. III. Choose the best option (a, b, c, or d) to complete each sentence. 1. The engineers…..designed the building received an award. 2. It is very difficult to integrate yourself into a community…….is quite different from yours. 3. He often finds fault with…….he describes as having no talent. 4. 1. I liked the friends …….. I went on holiday. 5. The university scientist ………. did research in the Amazon River basin found many previously unknown species of plants. 6. Have you ever met the author …….. the teacher mentioned in class this morning? 7. The fans …….. crowded the ballpark roared their approval. 8. Have you been to the Clayton Art Gallery? It has a new exhibit …….. includes the work of several local artists. 9. The man……along the corridor is our boss. 10. Tim has passed the exam,………….is great news. 11. Little Women,……….in 1868, is my sister’s favorite book. 12. Florida,………the Sunshine State, attracts many tourists every year. 14. His carelessness in doing test……I am worried may lead to a complete failure. 15. My grandfather,………..a wise man, has greatly influenced my life. 1. The story was very funny. The math teacher told the story. A.The story that the math teacher told was very funny. B.The story which the math teacher told was very funny. C.The story the math teacher told was very funny. 2. The girl went to the police station. Her case was stolen. A. The girl whose case was stolen went to the police station. B. The girl her case was stolen went to the police station. C. The girl the case of which was stolen went to the police station. D. The girl who’s case was stolen went to the police station. 3. Is the man your father? The man is standing at the gate. A. Is the man whom is standing at the gate your father? B. Is the man who is standing at the gate your father? C. Is the man standing at the gate your father? 4. Can the students give back their books? The students are leaving tomorrow. A. Can the students whom are leaving tomorrow give back their books? B. Can the students who leaving tomorrow give back their books? C. Can the students leaving tomorrow give back their books? D. Can the students whose leaving tomorrow give back their books? 5. The children were attracted by the show. It was performed by the animals. C. The show performing by the animals attracted the children. 6. The tree should be cut down. Its branches are dead. A. The tree whose branches are dead should be cut down. B. The tree its branches are dead should be cut down. C. The tree where the branches of which are dead should be cut down. 7. I saw a lot of new people at the party, ____________ seemed familiar. 9. Is there anything else ____________ you want to ask? 10. They have just visited the town ____________ location was little known. 11. He lives in a small town ____________. 13. We have a lot of things that we have to do today. 14. The young man who lives next door is very kind to my family. 15. There was no one for me to ask for help . 16. "Have you ever met the man ________ over there?" "No. Who is he?" 17. Tell me the countries. People drive on the left there. A. Tell me the countries which people drive on the left there. B. Tell me the countries where people drive on the left there. C. Tell me the countries that people drive on the left there. D. Tell me the countries when people drive on the left there. 18. The man is my uncle. He is talking to Mr Brown. A.The man talking to Mr Brown is my uncle. B.The man is talking to Mr Brown is my uncle. C.The man talks to Mr Brown is my uncle. D.The man talked to Mr Brown is my uncle. 19. The road which joins the two villages is very narrow. A.The road joins the two villages is very narrow. B.The road joining the two villages is very narrow. C.The road joined the two villages is very narrow. D.The road is joining the two villages is very narrow. 20. Haywood is the village ________ . 21. The coffee __________ in that restaurant was cold and tasteless. 22.The week ____ Mike went to camping was the wettest of the year. 23. Which is the European country ____ economy is growing the fastest ? 24. Martin is someone with ____ I usually agree. 25. Melanie was looking after a dog ____ leg had been broken in an accident. 26. I'd like to see the photo ____________ . 27.There are people __________ no one cares. 28. That is a problem, ____________ the government is now dealing. 29. It rained all the time, __________ was a great pity. 30. The Titanic,_________ , was supposed to be unsinkable. 31. Is that the lawyer to ___________ you spoke? 32. ____ are kept as pets in almost every country in the world. 33. The book __________ my father is interested is very expensive. 34. I enjoy taking a walk at night __________ the roads are quiet. 35. My car broke down, ____________ a real nuisance. 36. Do you remember the day __________ into this house? 37. The reason _______ I'm phoning you is to invite you to my birthday party. 38. The house _______ he lives is very old. 39.I recently went back to the village school _______I studied in my chilhood. 40. The girl living next to me is getting married next year. A. The girl that lives next to me is getting married next year. B. The girl lives next to me is getting married next year. C. The girl lives next to me gets married next year. D. The girl who is living next to me getting married next year. 41. "Is this the address to _________ you want the package sent ?" 42. "Excuse me, but there is something about _____ immediately." "Certainly." 43. Most folk songs are ballads ____ have simple words and tell simple stories. 44. A battery is a device _________ electricity by chemical means. 45 I have three brothers, _________ are policemen. 46. The agreement ended 6 -month negotiation. It was signed yesterday. A.The agreement which ended 6-month negotiation was signed yesterday. B.The agreement which was signed yesterday lasted 6-month. C.The negotiation which lasted six month was signed yesterday. D.The agreement which was signed yesterday ended 6-month negotiation. 48. Everything ______ they said was true. 50. _______ was a French Emperor, fought his final battle in Waterloo. 51. Vicky, __________ name was missed off the list, wasn’t very pleased. accounts to be managed over the Internet. 53. Many forest fires are caused by cigarettes ___________ out of cars. 54. The man_________ part in the robbery refused to give any information. 55. The travel agent gave me a brochure _______ all the needed information. 56.I read `The Old Man and the Sea ’, ________written by Ernest Hemingway. 57. Who is it_________is waiting at the gate? II.Fill each blank with who, whom, whose, which, …..
1. He knows a lot of people ______ live in Dalat. 2. Where is the book ______ he gave you on your birthday ? 3. A deaf person is the one ______ is not able to hear. 4. I met the girl ______ you talked about last night. 5. This is the woman ______ daughter is a doctor . 7. What’s the name of the girl ______ house has just been sold ? 8. The boy ______ broke the window was arrested. 9. The man ______ we met is working in my office. 10. The boy ______ sister works for your father is my classleader. 11. We will soon gather at the village ____________the festival is taking place. 12. Do you know the mane of the tourist ___________ came and talked about New Year in Canada? 13. I’m looking for a book ___________ tells us about traditional festivals of Asian people. 14. I couldn’t go to the show __________was held in Hoi An last summer. 15. This is the photo of a Hero ___________our teacher talked about in the lecture. 16. My brother has told me about the festival ___________ is held in Hue City every two years. 17. I recently visited the school __________ I used to study five years ago. 18. I couldn’t understand the dance ___________ I saw at the festival last spring. 19. I’m really intersted in the present __________ you gave me on my birthday. 20. Have you seen the photos __________ I took at the camp last week. 1. He came and didn’t say anything, ______ worried all of us. 2. Marie, ______ I met at the party, called me last night. 3. She’s the woman ______ sister babysits for us. 4. The story --------- the teacher told us was very interesting. 5. Do you know the girl ---------- is talking to them. 6. The test -------- the teacher gave us yesterday was very difficult. 7. The people -------- I met at his family were very nice. 8. Yoko told me about students __________ have taken the entrance exam 13 times. 9. The secretary....................I talked to didn't know where the meeting was. 10. I need to talk to a person ......................you can trust. You will feel better if you do. 11. Bob is the kind of person to...................one can talk about anything. 12. He is a person...................friends trust him. 13. Fm looking for an electric can opener......................also can sharpen knives. 14. People .................. live in glass houses shouldn't throw stones. 15. The problems .................. Tony has seem insurmountable. 16. The man ............. I introduced you to last night may be the next president of the university. 17. Cathy is trustworthy. She's a person upon ............... You can always depend. 18. Your career should focus on a field in...............you are genuinely interested. 19. People ................. outlook on life is optimistic are usually happy people. 20. Ms. Donaldson,................. teaches linguistics at the university, recently re ceived recognition for her research. 21. The earth, ................ is the fifth largest planet in the solar system, is the third planet from the sun. 22. The check................I gave Oliver was for work he'd done for me. 23. Melanie was looking after a dog..............leg had been broken in an accident. 24. One of the people arrested was Mary Arundel, ................. is a member of the local council. 25. The Titanic,................sank in 1922, was supposed to be unsinkable. 26. The Newspaper is owned by the Mearson Group, ....................... chairman is Sir James Bex. 27. She is one of the few people to ............. I look up. 28. Genghis Khan, _________ name means “very mighty ruler”, was a Mongol emperor in the Middle Ages. 29. The children _____ sang at the Mayor's parade were from the local school. 30. The school programme _______ has been interrupted by revision tests requires a regular course study. 31. The girl ______ dress you admire has been working for an export company since she left school. 32. The young man ______ was released after the court was found innocent of all the charges against him. 33. Is that the same film ______ we watched last year? 34. The girl _____ I borrowed the dictionary asked me to use it carefully. 35. The first television picture _________ John Logie Baird transmitted on 25 November, 1905 was a boy ______ worked in the office next to Baird's workroom in London. 36. Joyce Bews, ______ was born and grew up in Portsmouth on the south coast of England, _______ she still lives, was 100 last year. 37. The pollution ______ they were talking is getting worse. 38. Robert Riva, an Italian ____ used to play for Cremonese, now coaches the Reigate under 11's football team. 39. When I was at school, there was a girl in my class ______ skin was so sensitive that she couldn't expose her skin to the sun even with cream on. 40. Unfortunately, the friend with ________ I intended to go on holiday to Side is ill, so I'll have to cancel my trip. 41. The new stadium, ____ will be completed next year, will seat 30,000 spectators. 42. Blenheim Palace, _____ Churchill was born, is now open to the public. 1. I bought a motor. I can use it to travel to work every day. 2. My cell phone has become necessary part of my life. I only bought it a month ago. 3. My roomate has never been on the Internet. She is afraid of computers. 4. Some people dream of a job. They can do the job without technology. 5. The man is a computer expert. You were talking to him. 6. Some documents have been found. They were stolen from a car. 7. Marta has a brother. Her brother’s name is Manuel. 8. The dog won the race. The dog is mine. 9. Show me the shoes. You bought them yesterday. 10. Our school has a good laboratory. The students practise chemistry in this laboratory. 11. Edward has just moved to France. His mother died last year. 12 . That man looks very lonely. He lives in the next floor. 13. It rained all night. That was good for the garden. 14. The man is my father. I respect this man most. 15. The house is empty now. I used to live there. 16.Tet is a festival. Tet occurs in late January or early February. 17.Auld Lang Syne is a song. Auld Lang Syne is sung on New Year’s Eve. 25.I’m a boy. I’m wearing a white T-shirt. 30. Grandmother is the old woman. She is sitting next to Aunt Judy. III. Choose the best answer. 1. Post office is a place ______ you can buy stamps, mail letters and packages, and receive mail. 2. Do you know the date ______ we have to hand in the essay? 3. My uncle ______ you met yesterday is a lawyer. 4. The council is in discussion with Lord Thomas, ______ land most of the village is built on. 5. These adults, ______ come to my night class, are very eager to learn. 6. Regina, ______ you have never met before, is a genius in painting. 7. The paintings__________ Mr Flowers has in his house are worth around $ 100,000. 8. Oxford, ______ attracts many tourists, is often crowded in the summer. 9. It's the best film ______ has ever been made about madness. 10. She cycled from London to Glasgow, ______ is pretty good for a woman of 75. 11. Most folk songs are ballads ______ have simple words and tell simple stories. 12. ______ wins will go on to play Barcelona in the final. 13. I think the reason ______ we get on so well is that we both enjoy talking. 14. Children ______ diets contain high levels of protein do better in examination. 15. I'm sure that Keith will do well at university, ______ one he goes to. IV. Combine the following pairs or groups of sentences using relative pronouns. 1. Her many friends gave her encouragement. I like to be considered among them. 2. Her father died last year. She looked after him for over twenty years. 3. The bed has no mattress. I sleep on this bed. 4. There wasn't any directory in the telephone box. I was phoning from this box. 5. I was sitting on a chair. It suddenly collapsed. 6. Mr Smith said he was too busy to speak to me. I had come specially to see him. 7. I saw several houses. Most of them were quite unsuitable. 8. Graham took us to his office. It was filled with books. 9. Mr Marks is unhappy about the plans for the new dam. The stream flows across his farm. 10. They picked up five boat-loads of refugees. Some of them had been at sea for several months. 11. That is the man. He bought her car last month. 12. Those are the books. He has just bought them from the bookstore. 13. The students are from China, They are sitting in the front row. 14. I like the girl. I met met her at the party last night. 15. The boy is very happy, He won the race yesterday. 16. The teacher liked the composition. She wrote it last Monday. 17. The people are very friendly. We visited the two week ago. 18. The book is very interesting. It was written by Jane Austen. 19. The lady gave me good advice. I spoke to her an hour ago. 20. Is that the computer? Your father bought it last month? WHOM(who), WHICH, THAT: có thể lượt bỏ khi đứng vị trí là tân ngữ. Không được bỏ khi trước đại từ quan hệ có 1 giới từ. 1. In Mexico, 17th January is a day …………………….people ask for protection for their animals. 2. The house ………………I lived as a child has been pulled down now. 3. Stop him. He’s the man ………………..stolen my wallet. 4. There are many people……………….lives have been spoiled by that factory. 5. Is that the button………………you preesed? 6. Could everybody……………..luggage has got lost please stay here? 7. The man ………………I saw last week said something totally different. 8. They have invented a television set………………is as small as a watch. 9. My grandmother, ……………….was an extraordinary woman, lived to the age of a hundred and fifteen. 10. I’m working on a firm………………..main office is in London. 11. The firm, ……………..employs five hundred people, makes video recoders. 12. My boss, ……work takes him to a lot of different countries, has decided he needs an assistant in London. That’s me. 13. I work mainly in the Finance Department, ………………….is the smallest department in the firm. 14. The work, ……………increases a lot when the boss is away, is always interesting. 15. Zedco, ……………..has ten thousand employees, is an international company. 16. Vicky, ………………name was missed off the list, was not pleased. 17. The picture……………Laura painted is being shown in an exhibition. 18. The week …………….Mike and Harriet went camping is the wettest of the year. 19. Aunt Joan, …………….is a bit deaf, didn’t here the phone. 20. Henry, ……………..you’ll meet tomorrow, is also the member of the board. 21. I’ll see you near the post office……………..we met the other day. 22. The concert ……………..we’re looking forward to is next Saturday. 23. That was a kind of car with ……………I was not familiar. 24. The story to ………………I listened yesterday was interesting. 25. I’ll give you the address to ……………you could write. 26. The film about …………….they are talking is fantastic. 27. The woman about ………………..I’m telling you teaches me French. 28. There are two persons to ……………we owe more than we can say. 29. The success of shared holidays depends on …………….you share with. 30. More and more people are rejecting food………………don’t come from local producers. 31. Working on the internet form home is a possibility ………………many people are exploring. 32. Many people ……………….moved form the country are now returning to the city. 34. Parents …………….children are in college are working longer hours to pay their tuition. 35. Natural remedies are something ………………..more people are experimenting with these days. 36. A pacifist is a person …………………believes that all wars are wrong. 37. An orphan is a child ………………..parents are dead. 38. I don’t know the name of the woman …………………..i met yesterday. 39. This school is only for children…………………..first language is not English. 40. The woman …………………I wanted to see was away on holiday. 41. A coward is someone ………………….is not brave. 42. The girl ……………….was injured in the accident is in the hospital now. 43. I met Jane’s father, ………………..works at the university. 44. That’s a woman to …………………Jim used to be married. 45. The person ………………..did it was never caught. 46. The meeting to……………..i went was interesting. 47. She is a woman about ………………I told you. 48. The song to ………………….we listened last night was interesting. 49. It was a service for ……………..I was grateful. 50. Jack is the one …………………I miss most. 51. It was a kind of computer with ……………… I was not familiar. 52. Do you like the person ………………sits next to you? 53. There is one person to ……………….i owe more than I can say. 54. It was a kind of accident for ………………nobody was really to blame. 55. Do you get on with the person ……………... lives next door? 56. I must thank the man from ……………….. I got the present. 57. It is an event ………………… I would rather forget. 59. Don is a friend .................... I stayed with in Australia. 60. She is one of the kindest people ……………………. I know. III. Combine the following pairs or groups of sentences using relative pronouns. 1. Have you found the keys? You have lost them. 2. I like the dress. Trang is wearing it. 3. the fish is really delicious, we had it for dinner. 4. We stay at the hotel. Peter recommended it. 5. The church is 200 years old. Our class visited it. 6. The film was interesting. I watch it on TV last night. 7. The flat was very old. My family used to live in it. 8. The birthday party was too noisy. We went to it. 9. Who was that boy? You were with him this morning. 10. I don’t like the tie. John was wearing it. 11. The train was full of passengers and goods. We traveled on it. 12. Her many friends gave her encouragement. I like to be considered among them. 13. Her father died last year. She looked after him for over twenty years. 14. The bed has no mattress. I sleep on this bed. 15. There wasn't any directory in the telephone box. I was phoning from this box. 16. Mr Smith said he was too busy to speak to me. I had come specially to see him. 17. I saw several houses. Most of them were quite unsuitable. 18. Graham took us to his office. It was filled with books. 19. Mr Marks is unhappy about the plans for the new dam. The stream flows across his farm. 20. That is the man. He bought her car last month. 21. Those are the books. He has just bought them from the bookstore. 22. The book is very interesting. It was written by Jane Austen. 23. The lady gave me good advice. I spoke to her an hour ago. 24. Is that the computer? Your father bought it last month? 25. A girl was injured in the acciddent. She is now in the hospital. 26. A man answered the phone. He told me you were away. 27. A bus goes to the airport. It runs every half an hour. 28. I met Jane’s father. He works at the university. 29. Peter is studying French and german. He has never been abroad. 30. You’ve all met Michael Wood. He is visiting us for a couple of days. 31. A building was destroyed in the fire. It has now been rebuilt. 32. Some people were arrested. They have now been released. 33. We are moving to Manchester. Manchester is in the north-west. 34. I’ll be staying with Adrian. His brother is one of my closest friends. 35. Jonh is one of oldest friends. He has just gone to live in Canada. 36. The earth is a planet. It can support life. 37. A dictionary is a book. It gives you the meaning of words. 38. The book is about a girl. She runs away form home. 39. She is a woman. I told you about her. 40. I’ll give you an address. You should write to it. 41. The picture is beautiful. She was looking at it. 42. The movie is fantastic. Thhey are talking about it. 43. The song was interesting. We listened to it last night. 44. The man was kind. I talked to him yesterday. 45. The man works in the hospital. I told you about him. 46. The woman teaches me English. I am telling you about her. 47. That’s the woman. Jim used to married to her. 48. The students are from China, They are sitting in the front row. 49. I like the girl. I met met her at the party last night. 50. The boy is very happy, He won the race yesterday. 51. The teacher liked the composition. She wrote it last Monday. 52. The people are very friendly. We visited the two week ago. 1. Those are the books. He has just bought them from the bookstore. 2. The book is very interesting. It was written by Jane Austen. 3. The lady gave me good advice. I spoke to her an hour ago. 4. Is that the computer? Your father bought it last month? 5. A girl was injured in the acciddent. She is now in the hospital. 6. A man answered the phone. He told me you were away. 7. A bus goes to the airport. It runs every half an hour. 8. I met Jane’s father. He works at the university. 9. Peter is studying French and german. He has never been abroad. 10. You’ve all met Michael Wood. He is visiting us for a couple of days. 11. A building was destroyed in the fire. It has now been rebuilt. 12. Some people were arrested. They have now been released. 13. We are moving to Manchester. Manchester is in the north-west. 14. I’ll be staying with Adrian. His brother is one of my closest friends. 15. Jonh is one of oldest friends. He has just gone to live in Canada. 16. The earth is a planet. It can support life. 17. A dictionary is a book. It gives you the meaning of words. 18. The book is about a girl. She runs away form home. 19. She is a woman. I told you about her. 20. I’ll give you an address. You should write to it. 21. The picture is beautiful. She was looking at it. 22. The movie is fantastic. Thhey are talking about it. 23. The song was interesting. We listened to it last night. 24. The man was kind. I talked to him yesterday. 25. The man works in the hospital. I told you about him. 26. The woman teaches me English. I am telling you about her. 27. That’s the woman. Jim used to married to her. 28. The students are from China, They are sitting in the front row. 29. I like the girl. I met met her at the party last night. 30. The boy is very happy, He won the race yesterday. 31. The teacher liked the composition. She wrote it last Monday. 32. The people are very friendly. We visited the two week ago. 33. Her many friends gave her encouragement. I like to be considered among them. 34. Her father died last year. She looked after him for over twenty years. 35. The bed has no mattress. I sleep on this bed. 36. Have you found the keys? You have lost them. 37. I like the dress. Trang is wearing it. 38. the fish is really delicious, we had it for dinner. 39. We stay at the hotel. Peter recommended it. 40. The church is 200 years old. Our class visited it. 41. The film was interesting. I watch it on TV last night. 42. The flat was very old. My family used to live in it. 43. The birthday party was too noisy. We went to it. 44. Who was that boy? You were with him this morning. 45. I don’t like the tie. John was wearing it. 46. The train was full of passengers and goods. We traveled on it. 47. There wasn't any directory in the telephone box. I was phoning from this box. 48. Mr Smith said he was too busy to speak to me. I had come specially to see him. 49. I saw several houses. Most of them were quite unsuitable. 50. Graham took us to his office. It was filled with books. 51. That is the man. He bought her car last month.